EDMOND — For the second straight week Edmond Memorial's defense was spectacular, but this time it came in a rivalry game. The fifth-ranked Bulldogs smothered No. 8 Edmond North's offense that was short its starting quarterback Friday night, nearly going the entire game without allowing a first down in a 35-0 shutout at Wantland Stadium. 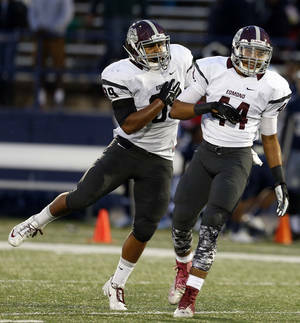 "We're scary good when we play together as a whole," Edmond Memorial senior defensive end Kourtney Williams said. "We've still got a lot of stuff to work on, but we're still a pretty good team." In two games, Memorial has been more than pretty good, especially on defense. The Bulldogs (2-0) have yet to allow a point and were never really in danger of doing so Friday night as the Huskies only found the red zone once following an interception return by Jordan Prince. But they immediately moved backward before turning the ball over. Edmond North (1-1) was without quarterback and Week 1 hero Stephen McClernon due to a foot injury and did not get a first down until 7:59 remained in the game. The Huskies finished with just 22 yards of offense and four first downs. "We've got potential over there," Edmond Memorial coach Justin Merideth said about the defense. "We always gotta watch film and see. It's never as good or as bad as you think. We'll watch film and we'll see. "We feel like we've got some potential, but we're still a long ways from that." Edmond Memorial quarterback Mick Mayerske delivered his second straight strong performance, scoring twice on the ground on 1-yard runs and completing 9 of 18 passes for 170 yards. It was Mayerske and receiver Jordan Reed that sparked the Bulldogs' offense on the third quarter's opening drive. They held a 14-0 lead but marched 80 yards in nearly three minutes for an 8-yard touchdown run by Parker Smith. "That really changed the night for us offensively," Merideth said. "If we can execute, we think we can be a solid offense and we can continue to be a solid defense." Warren Wand also continued to regain his form, rushing for 134 yards on 31 carries and scoring two touchdowns on short runs. He, Mayerske and most of the starters got most of the fourth quarter off to rest. But the Bulldogs' defense never stopped and hounded both Noah Tews and Carter Randolph at quarterback. "We didn't really change our game plan at all," said Williams, who had two sacks. "We just stuck to what we knew. We just focused on the run and forced them into the pass." Tews was intercepted three times, and Randolph never completed a pass. It was a far cry from last week's performance from McClernon that featured a game-winning drive and no turnovers. Edmond North coach Scott Burger said he hopes to have McClernon back next week, but he is still limping on his bruised foot. "Anytime you lose any starter — especially at quarterback — there's a reason why they're starters," Burger said. "Those kids that came in did fine. That's a tough spot, especially coming into a rivalry game."